You may have noticed that almost every day there’s something in the news that says investments are going to do something. Sometimes they talk about them going up, but more often than not it’s all about your investment dropping. It can be hard to ignore, and it can cause some of us to worry. As a result, many people are afraid to invest. Recent research has shown that 96% of millennials (people aged 25-36) rule out investing! I fully intend to dispel these myths – in reverse order! This is just a preconceived idea built on news stories and TV shows. How anyone expects to grow their wealth in a bank account probably earning less than 1% is beyond me! So investing is for everyone, you just might find the biggest companies won’t accept you unless you make the minimum investment. Our minimum is a lump sum of £1,000 or a monthly direct debit of £100. No matter if you’ve invested £1,000 or £1 million, if you’re in the same investment for the same time, you still get the same return. The percentage return is the same, it’s just how much you have invested which is different. There you have it – investing isn’t just for the rich. Investments don’t care if you’re male or female, rich or not, American or Chinese, or even if you believe the Earth is flat. If you invest in the same thing at the same time as 100 other people, you will all get the same investment experience. Bank accounts serve a purpose – don’t get me wrong. They let us run our daily lives by allowing us to pay for things daily, and probably only receive an income once a month! What they don’t offer is a purpose for growing your money. They simply store it. Banks are for your day to day life (current account), your emergency fund or if you are planning to pay for something in the near future (your holiday or a house deposit next year). The top instant access savings accounts on the high street offer 1.25% per annum*, but if you want to lock your money away for 5 years, you can get around 2.5%** (with the banks that maybe aren’t household names). The advantages of these are your money is guaranteed by the Financial Services Compensation Scheme (FSCS) up to £85,000. Great! The downside is, the money is guaranteed to grow slowly, and almost certainly guaranteed to lose its purchasing power. You’ll find your bank balance slowly increase, but the problem is inflation is growing quicker. So that money in five years won’t buy you what it could have bought you today. My favourite example is a bottle of coke. I normally give off about the price increase of a 500ml bottle of coke from 70p 10 years ago to £1.40 now, but now you can barely even buy a 2L bottle. They have kept the price the same (clever) but the amount you get now is less. Over the long term, cash savings are a waste of time. If you are able to put money away for the future for at least 5 years, then you need to look at the alternatives. So if you are just saving for the future, or even for your child’s future, a bank account isn’t going to cut it. The alternative is investing. First things first; What actually is an investment? The simple answer: something where you can earn two different types of return. Firstly, an ongoing return or income and secondly, the potential for the value to increase so that you make money when you finally sell the investment. That might not be the definition you were expecting – but it’s important. For these types of investments, I’m talking shares, fixed interest and property. What it isn’t is buying cryptocurrency, or gold, or futures. These types of products are called “speculations.” For those who don’t like the fancy words, they are “gambles”. The only way you make money is you buy them with the hope that when you sell, they are worth more. They don’t produce an ongoing income. Shares pay dividends. Fixed Interest (or bonds) pay you an annual interest rate. Property can earn rents. These are investments. What you shouldn’t do is put all your eggs in one basket. So you buy funds which invest in lots of different shares, or lots of different bonds, or lots of different properties. You should also buy funds which invest in lots of different countries. This way, you get lots of different dividends, or lots of different annual interest payments, or lots of different rental incomes. And so, you have an investment portfolio. It’s not complicated, it’s common sense! If you don’t want to manage it yourself, use a company – like us! What’s complicated about that? The hardest myth to dispel is that your money might go down. I can’t argue this because it is true. However…. We don’t expect anyone to invest money they know they need next month or next year. This is money which is going to be around for a long time. Historically, long term investments beat cash and inflation over periods of five years or more. This graph shows our risk grade 7 portfolio over the last 20 years. The bottom, almost flat brown line is what you can expect your cash in the bank to do. The grey line is if you were invested 100% in shares (FTSE All Share) and the green line is 100% in UK bonds. 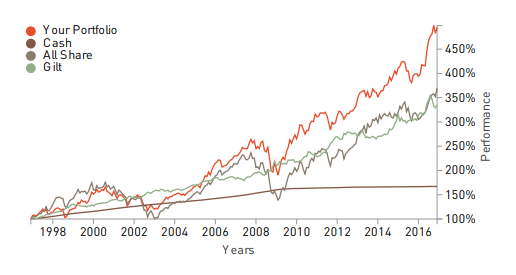 The red line is the portfolio return (a mix of cash, bonds (Gilts are UK bonds), property and shares. Yes, there are many occasions when the red line goes down, but you can see the power of being invested for a long time. I don’t hide from the fact that from time to time your investment will go down, but by sticking with the plan, you can be rewarded. So there you have it – why I think 96% of millennials may need to reassess their beliefs on investing. It doesn’t have to be scary, it doesn’t have to be complicated and it doesn’t have to be for the rich. Have a go with us here, and we won’t chase you or email you about it. It’s completely anonymous until you go as far as signing up. What have you to lose, other than the guarantee that your money in the bank is doing nothing for you? Remember: Investments can (and will from time to time) go down as well as up, and past performance isn’t a guide to future return.